“Can you believe we are parents?” I say to my husband Bernard as I feed our son. We knew he was coming; we prepared for this for nine months; still, holding our son, being parents, it is surreal. Before our son arrived, a woman asked me how long Bernard and I have been married? I thought the question was odd because by the third trimester I was only getting asked pregnancy and baby questions. I replied, “Going on three years.” She nodded her head then said, “That is a good amount of time, but beware, children change a marriage.” I thought it was an interesting thing to say to someone particularly because I didn’t really know this woman well. After she said it though, I started to notice the number of articles and chapters that are dedicated to marriage after children; it was enough to cause me to pause. Would Bernard and I’s relationship take a nose dive? Would we suddenly change into different versions of ourselves and all the groundwork we had put in over the last three years (eleven total together) go out the window? I was anxious about it so of course, I brought up the topic to Bernard, but in the end, we just agreed to communicate the way we always do and called it a day. My husband Bernard, our son, and I. Flash forward to the arrival of our son – our first disagreements fell under the category of we do not know what we are doing. Do we pick him up every time he cries? Do we put him in the swing too much? Should we be holding him more? Our differing opinions on these subjects were the basis for those disagreements. But then this past week we experienced a more contentious argument in the wee hours of the morning when we were getting ready to do a feeding. Before I get into that battle, I feel I should break down a common Bernard and Abigail disagreement. Bernard and I’s typical argument always has the same root cause: Bernard has his pace of which he moves through life, and I have mine. Those two paces are not the same. My pace I would categorize as quick, Bernard’s pace I would call slow – but he would likely disagree. When Bernard is not moving at the pace at which I feel he should be moving, my tone can become sharper, which irks Bernard. He then becomes defensive, which causes me to become defensive, and ultimately we both end up apologizing. The battle we experienced the other day once again touched on our typical conflict. I popped up quickly for the 1:00 AM feeding and I roused Bernard who doesn’t wake up as easily as I do. I tell him it is time for the feeding and I head downstairs to prepare the bottle and start pumping while Bernard is supposed to be getting our son changed. I noticed just before I start to pump that I haven’t heard Bernard, so I walk back upstairs to find him curled up in bed – he had fallen back to sleep. My tone is sharp when I wake him up the second time because I am frustrated this causes Bernard to get defensive and agitated, next thing we know we’re in a battle that neither of us is managing well because we are both exhausted. Bernard and I’s disagreements never last long, and we always apologize. The next day we had a discussion of how best to handle this going forward. Arguing at 1:00 AM is not something we want to make a habit. We both expressed what we needed from the other person. Bernard needed me to be mindful of my tone and wake him up more nicely. He explained that hearing the sharpness of my tone when he is just waking up puts him on edge. I explained that I needed Bernard to be more proactive about getting up to do the feeding – the sooner he gets up, the sooner we can get back to sleep. We each acknowledged the other’s concerns and agreed to do our best to be more mindful of the other’s needs. We also agreed to be patient with one another while we work on these things. I am happy to report; we have both been doing our part to meet the other’s needs. When you and your significant other are at odds what is the root of the problem? What needs must be met to move on to a solution? Do you give one another patience to work on him or herself, or do you expect an overnight transformation? Perhaps that woman was right; children do change a marriage – how could they not? But, if you and your partner commit to a well-established foundation and communicate maybe the change will be a positive one. 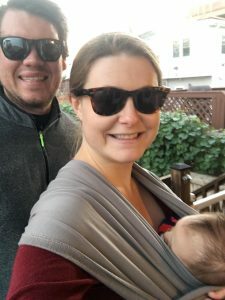 This entry was posted in Wives and tagged children, fatherhood, Marriage, mom life, motherhood, new parents, parenthood, Relationships.